Celebrate star gazing, nature and sky photography, little ones, dreams, night time rituals, and the color blue with this stunning kit! 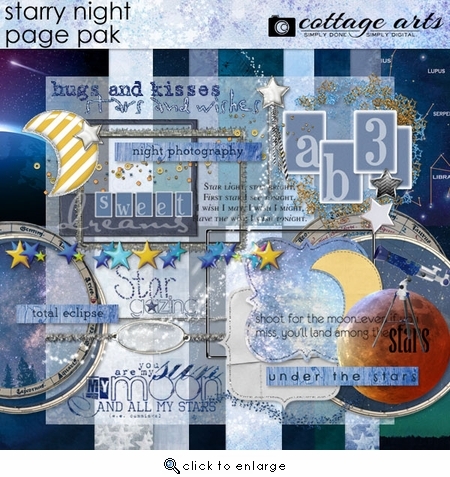 Full kit includes 18 - 12x12 gorgeous sky papers, AlphaSet, stars, frames, moons, telescope, tinsel frame and fibers, glass and metal accents, star sprays, star tail, mats, title overlays, astrology chart, star charts, designer word art and quotes, plus more! Keywords: Hugs, Kisses, Sweet Dreams, Star Gazing, Total Eclipse, Night Photography, astronomy, science, sun, moon, blue, yellow, word art, star.